A geopark is a large-scale park area that teaches us new things about the world we live in. 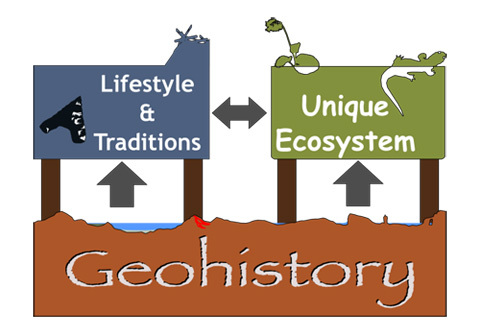 Geoparks are places that show us the connections between the geology of the land we live in (formed by plate tectonics and volcanic activity), the ecosystems of that land, and the lifestyles and traditions of the people who have lived, and continue to live there. To put it a little differently, they are places that show us how the Earth is put together. 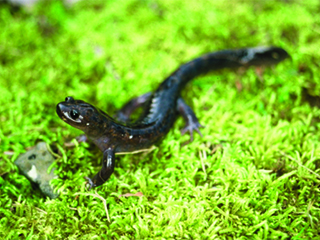 Besides being places where you can discover the connections between geohistory, ecosystems, and lifestyle, geoparks also conduct environmental conservation activities, educational activities, and exciting events for local areas. Let’s take a trip to the Oki Islands to learn about the mysteries of the Earth! The Oki Islands UNESCO Global Geopark is a precious place where you can discover how the impressive landscape, the unique ecosystem, and the diverse culture of the local people developed, as well as the deep connections between people, nature and the land. Why not come and search for the keys that will unlock the mysteries of the islands? The Japan Geoparks Network promotes national geopark activities. As of July 2017, there are currently 60 areas in Japan, including those that have been officially recognized as Japanese geoparks, which are participants in this network. This organization is a global network of geoparks that functions under the auspices of UNESCO. Geoparks must receive authorization from the network to become members. As of July 2017, there are 127 areas in 35 countries around the world that have been recognized as global geoparks. 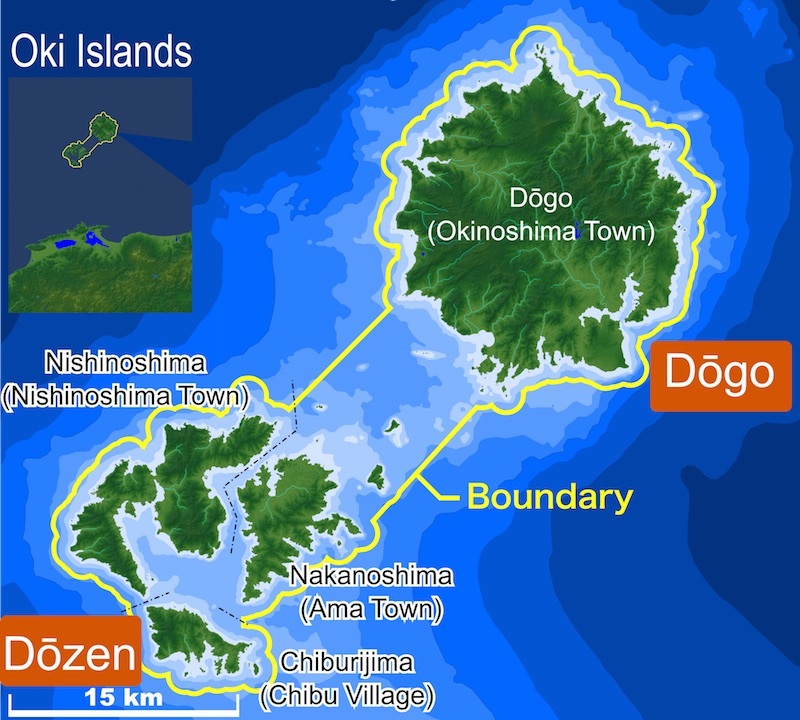 The Oki Islands UNESCO Global Geopark area (indicated by the boundary line in the map below) encompasses four inhabited and many uninhabited islands located in the Sea of Japan 40-80km north of Shimane Prefecture (south-west of mainland Honshu). As isolated islands, marine life and the fisheries industry is of central importance to the way of life of the people. In consideration of this, aside from land area, the geopark also includes 1km of sea area from the coastline. The geopark has a total area of 673.5 km² (land area 346.0 km² and marine area 327.5 km²). The land of the Oki Islands has developed through a series of stages: from being a part of the Eurasian Continent, the land sunk to the bottom of a lake on the continent, and then the bottom of a deep sea as the Sea of Japan was formed. This land then surfaced due to volcanic eruptions, and the islands were born. They later became connected to mainland Japan during the glacial ages, to eventually become the remote islands they are today. 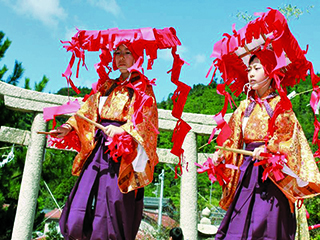 This geohistory has given birth to the unique ecosystem and cultural traditions of the Oki Region. The islands did not become isolated by breaking off from the mainland of Japan. Rather, changes in sea level throughout history caused them to become alternately connected to the mainland and isolated islands several times throughout history. During the last glacial age 20,000 years ago, the sea level declined 130m. As the sea between the islands and the mainland is only 70m deep, the islands became connected to the mainland Shimane Peninsula. Post-glacial warming caused the sea level to rise again 10,000 years ago and the islands became isolated as they are today. Uncover the Mysteries of the Land! 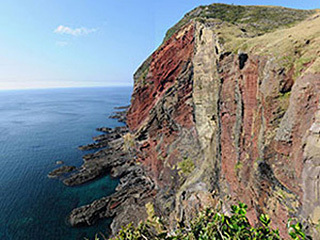 The Oki Islands UNESCO Global Geopark isn’t just a place where you can see precious geological heritage. It is a place that tells the story of the land, connecting the ‘Geohistory’ of the islands created over millions of years, the ‘Unique Ecosystem’ that developed on this land, and the diverse ‘Lifestyles and Traditions’ of the people that are still present today. In the geopark there are many ‘geosites’ where you can also learn about the geology of the land as well as the ecosystem and the lifestyles of the people who live there. There is a story to be discovered at each of the geostites.